Interfaith CEO Greg Anglea and Board Chair Rev. Meg Decker, with Escondido Mayor McNamara. 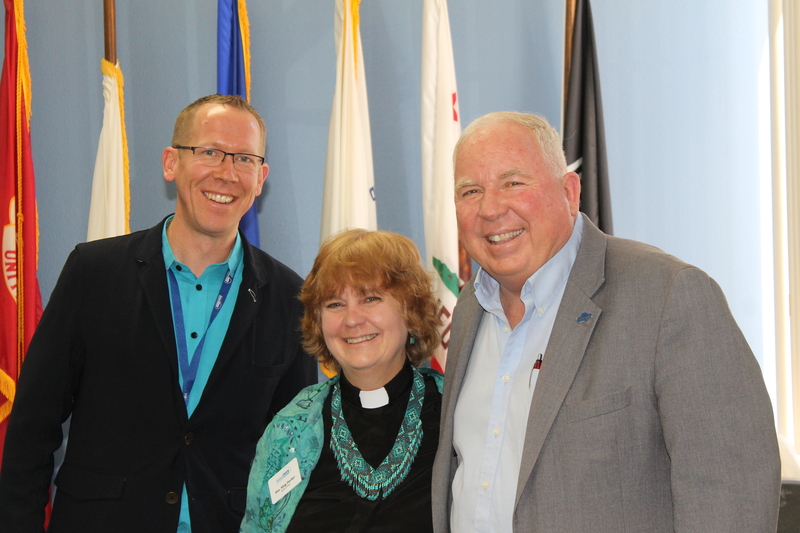 Mayor Paul “Mac” McNamara visited Interfaith Community Services during his “Meet the Mayor” series of visitations throughout Escondido. His main goal is to get familiar with members of the community in an informal setting. This week the event was hosted at Interfaith Community Services. Topics like pot holes and broken sidewalks, transportation systems, and eco-tourism were discussed alongside how to address the needs of our community members experiencing homelessness. “I would like people to know us [Escondido] as a compassionate city, people who take care of their neighbors, and help people. Because we all could fall down, and I just hope that when I trip, that someone’s there to help me get back up.” said Mayor Namara. One resident expressed their concern of where those experiencing homelessness can go to sleep at night. Mayor McNamara also discussed how he feels there are many issues that need to be addressed within the individual before homelessness can ever be permanently resolved for them. Rehabilitation begins with meeting people where they’re at, and this is what Interfaith strives for. For those who are experiencing homelessness and affected by addiction, mental health illnesses, and physical health conditions, Interfaith offers services through our Recovery & Wellness Center. With our new integration with healthcare, our goal is to improve the mental health and wellness of individuals and families in need. “It’s not just an effort of the city, or me, but it’s a collaboration of the community. It’s also the 150 professionals here at Interfaith who have dedicated their careers to helping others.” – Interfaith CEO, Greg Anglea. To learn more about how Interfaith and Mayor McNamara are working together to help our neighbors experiencing homelessness, please attend our next General Membership Meeting every 3rd Wednesday of each month, or schedule a tour by calling 760-489-6380 ext. 206.